Stay at this pet-friendly Lumberton hotel which is highly ranked on TripAdvisorÂ® of hotels in Lumberton. 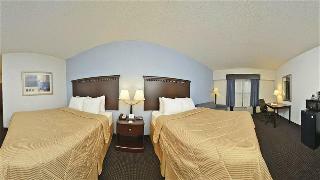 Welcome to the Best Western Lumberton, ideally located just off Exit 22 on Interstate 95 in Lumberton, North Carolina. This Lumberton area hotel is adjacent to a 24-hour WalmartÂ® Supercenter, Lowe's Hardware, Hardees and Office Depot. We are also conveniently located across the street from Chick-fil-A, StarbucksÂ®, Firehouse Subs, Panera Bread and FastMed. The Best Western Lumberton offers spaciously appointed guest rooms and suites, each equipped with a microwave, refrigerator, 32-inch LCD television with over 40+ HD Channels including two HBOÂ® channels in HD, ESPN HD and ESPN2 HD and free high-speed Internet access. Hotel guests will wake each morning to a complimentary breakfast with fresh hot waffles and a rotating menu consisting of scrambled eggs, bacon, or sausage. Additional amenities at this North Carolina hotel include an outdoor swimming pool, free access to a nearby fitness center, and a small business center. Pets are welcome for a small fee of $10 per night. Guests staying at Lumberton hotels will enjoy being close to UNC Pembroke (UNCP), Fort Bragg, Pope Air Force Base, the Lumber River State Park, the North Carolina Cancer Institute and the Southeastern North Carolina Agricultural Center. Guests will also be minutes away from great golfing and local events such as the Book'Em NC, the Lumbee Pow Wow, Rumba on the Lumber and the NC Horse Council Cowboy Up. Key area attractions also include the Darlington Raceway, Givens Performing Arts Center, and the Carolina Civic Center. For superior customer service and a centralized location make a reservation at our Lumberton hotel today, the Best Western Lumberton!